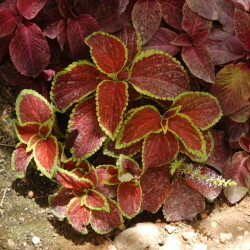 The Painted Nettle is one of the most popular plants for interior greening, and is widely used outdoors where its conditions are met. 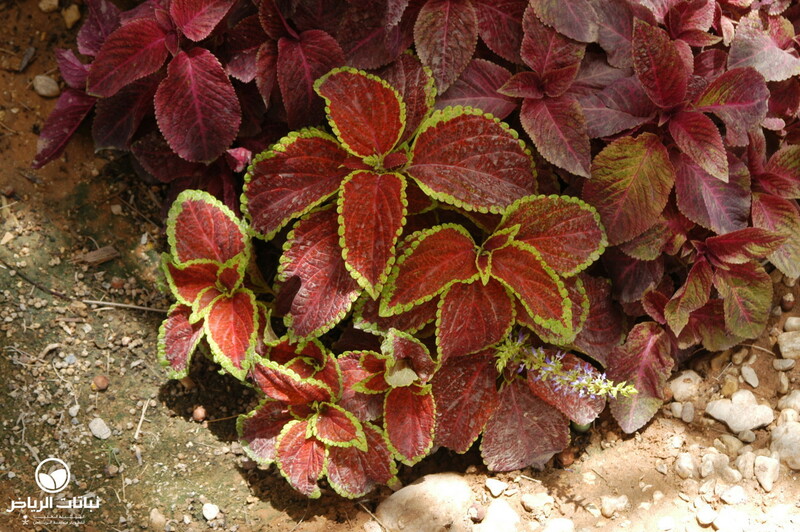 They are tender perennials from southeast Asia found in shady, humid environments. 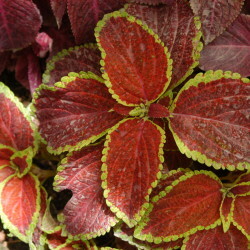 If grown as bedding plants, they create masses of multi-coloured foliage to a height of about 30 cm. 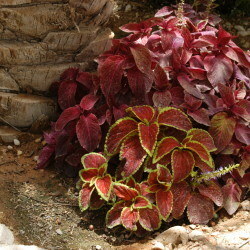 They are more valued when planted in mixed borders, where they grow twice as high to form a round, bushy eye-catcher. 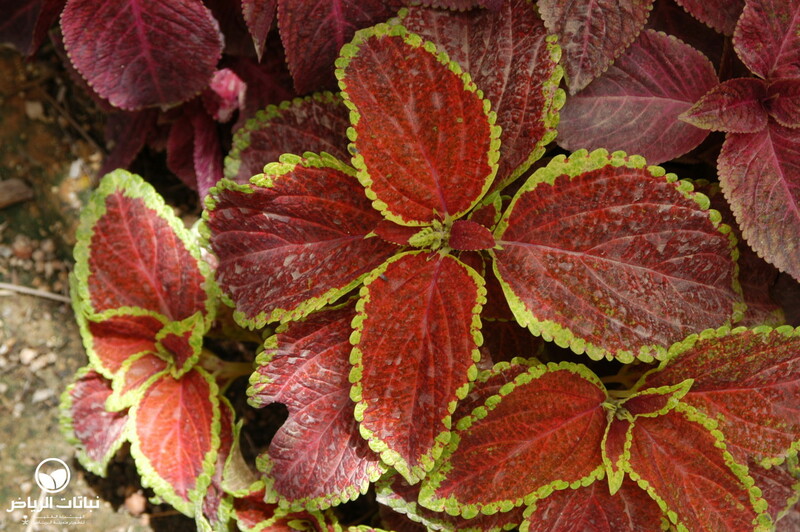 The variegation is outstanding, in shades of green, yellow, scarlet, red, pink and ivory. Terminal flower spikes feature azure florets that are usually pinched out, since the foliage is this plant’s main, spectacular attraction. In Arriyadh’s winters, Painted Nettles take full sun, but during the summer they are best sheltered, especially during the afternoons. Frost instantly kills this plant, and strong winds twist the leaves or entire branches. It appreciates fertile soil with ample water, but without waterlogging. 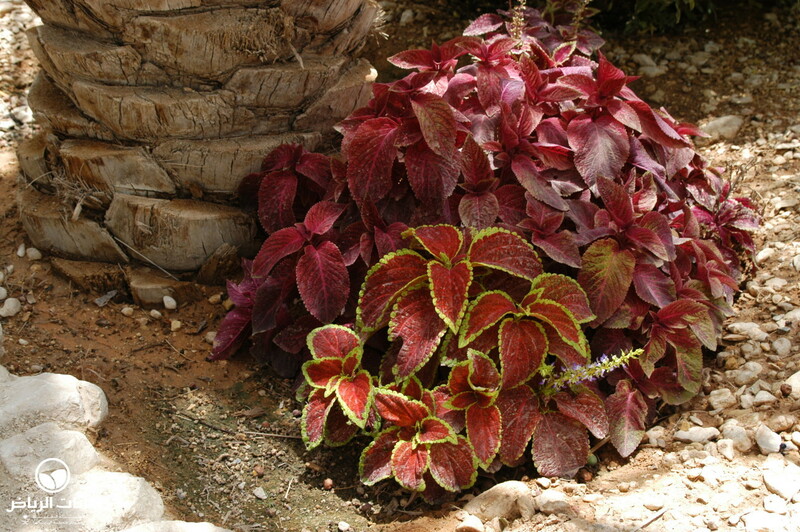 It is very easy to grow in pots and containers. The easiest method of propagation is by placing cuttings in water or planting them in a mixture of peat, compost and sand with some cover to reduce transpiration. Sowing is an alternative in order to pick one of many colourful varieties, or to achieve random forms. They respond well to fertilising and do best with occasional pruning to rejuvenate the stems. Frequent pinching is recommended to form a denser habit. Their moderate to high maintenance requirements limit the use of Painted Nettles to well-kept gardens and pedestrian precincts.